TutorMing's New Year Special is here! Time to achieve your goals! From December 23, 2018 to January 6, 2019, TutorMing has some gifts for all the Chinese learners! If you are a student of TutorMing, you can enjoy free classes with us during the above mentioned time period. Furthermore, after your class, you will also get a 10.00 USD coupon. The more classes you take, the more coupons you get! If you are NOT our student, it’s also the best deal to start your Chinese journey. You will not only receive a special discount with all of our packages, but you also have the opportunity to take part in our free class promotion. Additionally, if you buy one of our packages with friend, both of you will receive an extra bonus! Don’t hesitate! Let TutorMing help you setup your New Year’s Goal! From December 23, 2018 to January 6, 2019, you can take classes at the appointed times for free. Gift 2. The more classes you take the more coupons you get. After finishing your class during the event, don't forget to give us a review and you will get a $10.00 discount coupon on our Mandarin category-specific packages. Invite your friends to take a demo class! If your friend decides to get the full package, both of you will get receive 10 bonus classes and your friend will get 10% discount. Share your positive experience with us and provide the screenshot and link to us via mail (cp_tm@tutorming.com), you will receive 1 bonus class for each. From now until January 6, 2019 you can buy all of our Mandarin category-specific packages with 10% off. From December 23, 2018 to January 6, 2019, you can take class at the appointed time for free. If you buy TutorMing’s package with friend, both of you will receive extra 10 bonus classes. 2. 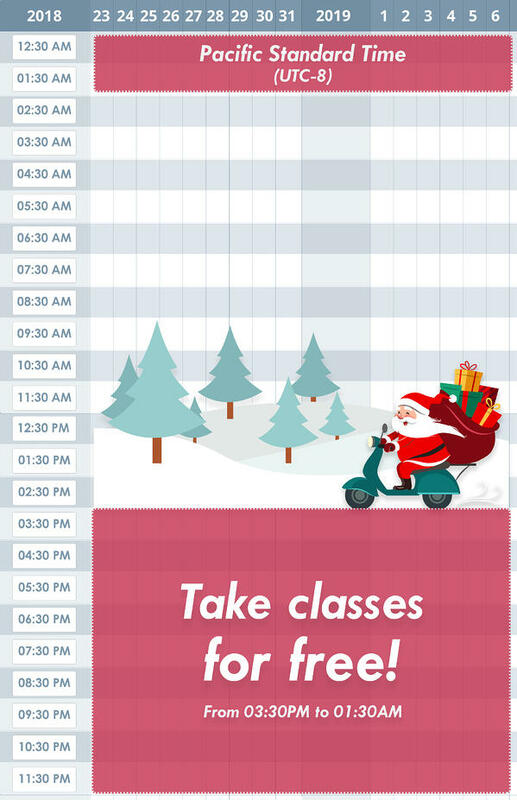 The scheduled time of free classes are based on UTC-8. 3. TutorMing will keep track of all the free classes you take. Your credits and coupons will be refunded and sent out on February 14th. 4. The coupons are valid until Feb 28th. 5. The 10.00 USD coupons can be used with the Black Friday 200.00 USD coupon. 6. TutorMing has the right to accept, decline or limit the use of any coupons. 7. Coupons can only be used when you select "One-Time Payment" as a billing option. 8. TutorMing has the right to stop or cancel the event anytime. 9. Be aware that if you book the class but you are absent, the credit WON'T be refunded.